Peep the blur, it was a bumpy but fun ride! During my travels, I’ve learned that each destination has its own special calling card. Londoners love a good cup of tea, New Yorkers adore an available yellow taxi, France enjoys a pungent cigarette and Barbados boasts my favorite, the Reggae bus. Don’t be afraid, the Reggae bus doesn’t only appear during Cropover, the island’s annual celebration akin to Mardi Gras. This mode of transportation is just as fun as it sounds, and as long as you relinquish your need for personal space and a smooth ride, it’s a wonderful cultural experience. Parlour co-founder Shannon and I discovered the bus after a trip to Lime Grove and Second Street from our hotel in the Gap. We’d had a few delicious rum punches at Cafe Indigo and were ready to return to our room but instead of hopping in a cab, which could cost $20+ Bajan, we decided to give the bus a try. I love any chance to people watch, the ride was cheaper (about $2-5) and according to our friends, the bus would have a soundtrack. What’s not to like? As we awaited our bus, a good number of alternatives passed by. Each coach was packed to the brim with people, and still the passengers managed to find more room to squeeze on. Here in New York, space is something to fight over but in other countries there is a different atmosphere, like the English and their penchant for staring. 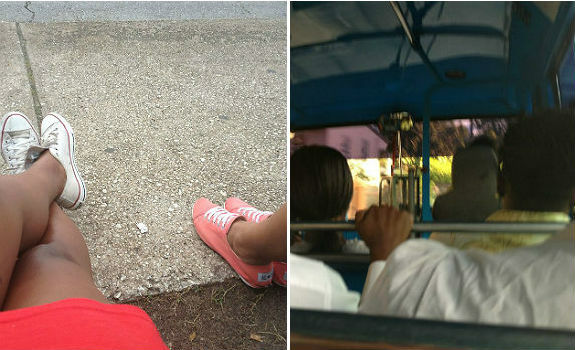 Once our bus arrived, Shannon and I hopped on and took our spots standing in the aisles and held on for dear life as the bus jetted down the roads and swerved around the pathways. Like the other buses we saw at the stop, more and more people piled on and somehow there was —not plenty, but —enough space. And we got the chance to “get up in” the everyday life of Bajans, while listening to a bit of Bob Marley and Mavado, which is the point of travelling to another country, right? So while you’re in Barbados, take a moment away from one of our Eat, Play, Love chosen hotels — Colony Club, The House and Tamarind — to catch a ride on the Reggae Bus. You’ll be glad you did!